New show just announced! 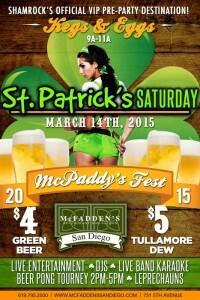 This Saturday, March 14, as part of the ShamROCK celebration in downtown San Diego, Rock Out Karaoke will take the stage with you at McFadden’s Irish Pub. We’ll be melting faces at the official VIP pre-party from 3-6pm. Come early for kegs & eggs, more live entertainment with our friend Pat Hilton, DJ’s, drink specials, and more.